UniFirst Comfort First® floor mats help protect workers' joints and muscles. UniFirst Comfort First® anti-fatigue mats are manufactured using cushioning nitrile foam rubber to protect feet, legs, and back from the stress caused by standing on hard floor surfaces for lengthy periods. By preventing such physical discomfort, our anti-fatigue mats can help contribute to improved productivity levels helping to keep workers focused on the job at hand. We manufacture our Comfort First® anti-fatigue mats to stand up to the toughest conditions; they're heavy enough to stay in place, yet light enough to be easily moved from work station to work station. 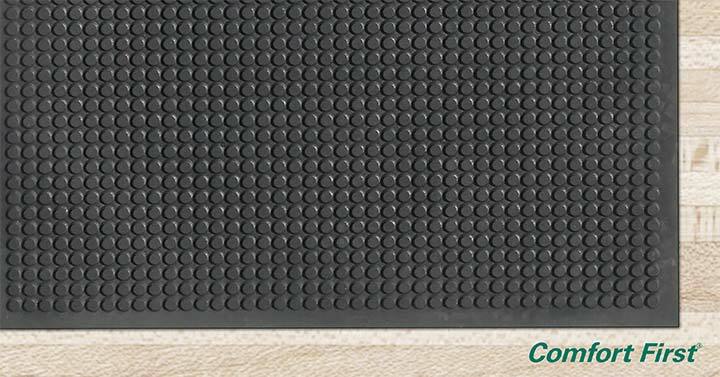 All Comfort First® anti-fatigue mats are certified as “high-traction” by the National Floor Safety Institute (NFSI). Trust UniFirst anti-fatigue matting to help create a safer, cleaner, and more comfortable work place. If you'd like to learn more about Comfort First® Anti-Fatigue Mats, or our other floor mat service programs, see the floor mats collection online in the UniFirst Facility Service Programs Catalog. We also offer a complete line of facility service products and floor mat rental services, including entrance mats, scraper mats, logo mats and “wet area” mats.